Hey all! Hope everyone is having a FAB weekend with family and friends! Go visit those lost tomorrow and remember the good times! Over here in good ol’ ND we’ve definitely made the most of this long weekend and amazing weather already! Yesterday we went on a long hike down by the lake here and it was just perfect hot weather with a breeze to keep us cool! After Harper’s nap we headed to my favorite state MT to visit the Beaver Creek Brewery in Wibaux! Check out this sweet new MT sign! I have been trying to be less wasteful, in reference to the Paleo Banana Bread post a week-ish ago. I have been buying organic rotisserie chickens for some time now, its an easy go to for Hudson’s lunch. Toss in a quesadila or pieces along side some noddles. But I toss the carcass every time. 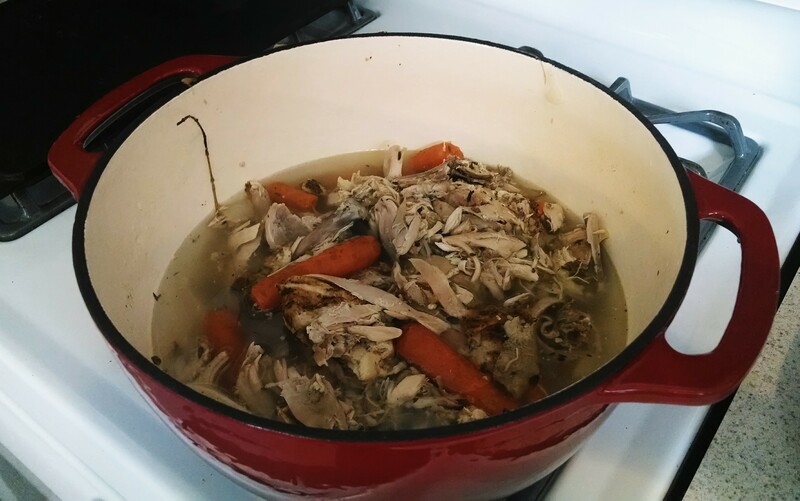 Well I finally decided to take the plunge and try to make chicken stock from it. Why not right!? It was easy peasy! By making it myself I had control of every ingredient. I will not have to search a label because I MADE IT! Okay, I am a wing it kind of person in the kitchen I add a little of this or that, then forget how to replicate it. Anywho, the same premise was applied to the chicken stock. I rummaged through my pantry and looked up a couple recipes on line to get a guideline. So here it is. One Chicken Carcass, keep the bones and the dark meat there is a lot of flavor in both. About 5-6 carrots washed and cut in half. Same amount of celery and same process. An entire white onion, quartered. A few sprigs of Thyme( because I had it on hand, you could use rosemeary or sage.) I added some salt and pepper. Put everything in a heavy bottomed pot and add enough water to cover the chicken. Let it simmer for 4 hours on low-medium heat. I would stir it every once in awhile. After the time it up strain the liquid from the bits and pieces. Then toss the bits. Let the liquid cool and store it in a glass jar for up to a month. Easy Right! Try it out, for the first attempt it tasted AMAZING! Tasty! Have a good week Friends! I’ve been really homesick lately and if I didn’t have Harper I’d prob be going crazy!! I think a lot of it is the turn in weather and normally this time of year we’d be enjoying beautiful Missoula, taking our daily hikes up Blue Mountain, going to the river, you name it, anything outdoors in Missoula that is a 5MIN DRIVE!! It’s flat here with not much going on in the recreational department aside from walks around the neighborhood. Exactly why I whipped out rollerblades to change it up ;). The other day a storm came raging through our neighborhood. As we watched the raindrops pelt the windows, Hudson could not understand why he wasn’t allowed to play outside. He spent ten minutes in a tantrum before he realized the storm had passed. Silly Baby! Awhile back Gramma let him play in puddles barefoot and he thought it was the greatest. So when the sun peeked out I decided to let him have some fun! Hey Friends I hope you are having an amazing time with loved ones and enjoying some nice weather in your neck of the woods! 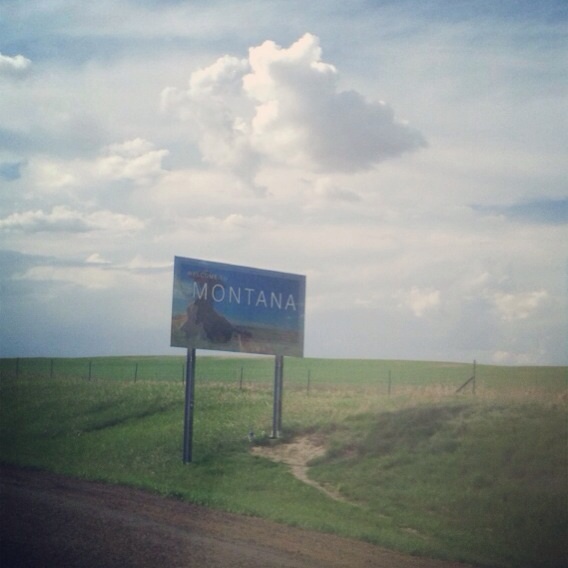 Montana on the other hand has decided to dump rain on and off all day long. Kind of hard to have fun outside when all you can see in the distance is grey clouds. A perfect day to bake am I right?! During Hudson’s nap I felt the need to use my brand new Kitchen Aid stand mixer….I have been dying for one for years. Husby finally said go get it, Happy Mother’s day! Whoot Whoot! Hey friends I hope you are doing well and having fun with your kiddos and family. Recently, I have decided with my doctor’s guidance, to attempt an elimination diet….life style change. Many have heard of this in reference to breastfeeding, this is not the case for me, Hudson has been weaned for about two weeks. Fingers crossed we are in the clear, anywho back on point. I am trying to make this change because of skin and stomach issues I have had my entire life. The major problem I have been facing is skin rashes covering my arms and up my neck to my chin. Needless to say allergy medication has been my saving grace for far too long. After reviewing my medical history with a new doctor we came to the conclusion an Elimination Diet was the only option. Of course, the word ELIMINATION sounds awful! I cant have chocolate or wine…what is a girl to do… with very minimal food options I thought for a second…do I want to deny myself and just deal with bad skin and acid re-flux….FOREVER.